It's time to welcome another joyous spring and with it the much awaited VIBHA Future Tech Cricket Tournament in Atlanta. Thanks to you all, together we have made a positive difference in the life of underprivileged children for the past 15 years. We will be hosting this year's event on Cricketing Mats at the baseball fields at East Roswell Park. The preliminary rounds will be held on April 26th and May 3rd. QF, SF, and Finals will be played on May 10th. Registration for this year is open, so please gear up and get your teams ready to battle it out for a noble cause. 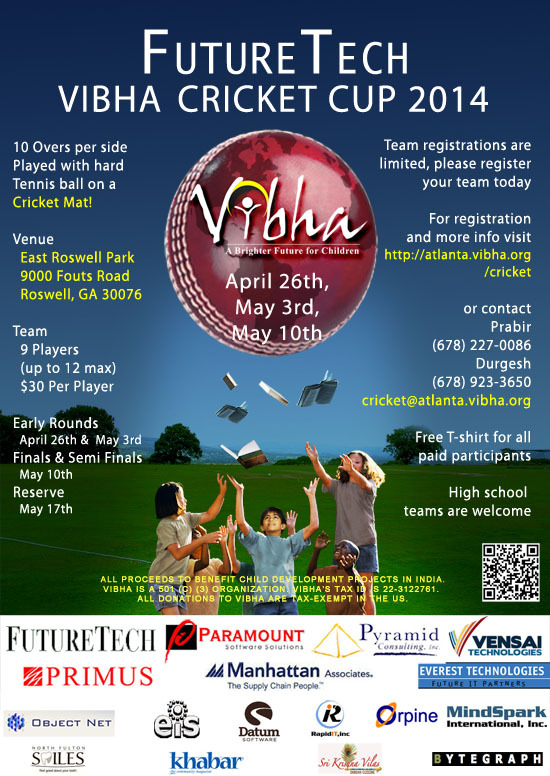 You can register your team for the event online and get more information at the Vibha Future Tech Cricket http://events.vibha.org/atlanta/cricket/register website.